We all know that we cannot reduce pollution of our biosphere without reducing human growth on earth. Any more than a bathtub could contain an infinite number of marbles. The more we grow – the more we unbalance the healthy relationships between ourselves and the rest of the biosphere. The earth biosphere cannot change how it balances its parts (see Bare Bones Ecology Energy Handbook – ) in order to stay alive. It’s parts are energy and matter – just like our parts and all of life. Earth, air, energy and water. The big LIFE balances its parts very much like our parts balance, and all of life balances its parts. (See the Bare Bones Biology series on climate change that begins with Bare Bones Biology 092, on the website http://FactFictionFancy.Wordpress.com). We are not God. We cannot adapt the facts of life to suit ourselves. What we can change is our behaviors, and that would be enough if we would adapt our behaviors to suit ourselves to the facts of life. Instead of trying so hard to adapt the facts of life to suit ourselves. The corposystem propaganda is once again trying to confuse us about how life works. This time they are claiming that we can adapt to the changes in the biosystem. Or – and I just found a real book authored by a famous reporter that has the title “earth” and is not at all about the earth. (If you want to hear about a book that DOES address reality, check out Eaarth by Bill McKibben. This new “earth” book is not about the earth – not at all. It’s about people. This is really odd, given that people can’t make earth alive – it is the earth that keeps us alive. People wouldn’t be here at all if it were not for the whole earth ecosystem. And the way the Biosphere stays living is to keep all its parts balanced, and the way it does that is by the functions of all the millions of species that live on the earth. The living earth must, like all living things, keep its parts balanced in order to stay alive. Just like ourselves, the earth can change how it does some things, but it cannot change what it must do. What it must do to stay alive is balance the earth and air and water – all the elements that recycle, for example oxygen and carbon – and the energy that it gets from food. We cannot adapt our biology, because it is genetically programmed, and so is the biology of the entire earth ecosystem. Genetically programmed. Well-adapted species, such as the grasses in the photograph (right here in the back yard in New Mexico), fit every part of their life cycle to the conditions around them. 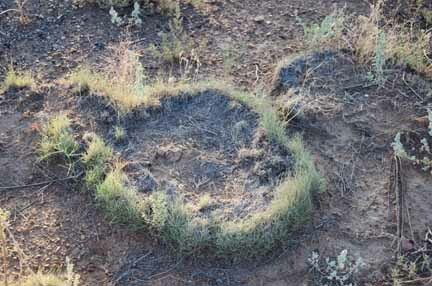 This grass grows in a circle, in the dry, easily eroded environment. The grass roots and the little dam of its growth style help to nurture the soil by preventing erosion and also by capturing water when it does rain, and by retaining the little rabbit turds that will nourish the plant, as the plant nourishes the rabbits that eat the grasses. This is very much how our relationship with the biosphere MUST be if we want to be a well-adapted species. Living sustainably healthy lives. All these behaviors are genetically programmed. Any other kind of grass could not adapt to the same functions as this species of grass, and if the climate changes too much where it lives, the grass will die. Nor can humans adapt to changes in our environment outside of our physiological limits. http://en.wikipedia.org/wiki/Keystone_species). This describes real biological adaptation. It requires that all the species in the area nurture each other. That is the whole point of an ecosystem. And it takes hundreds or thousands of years for all the genomes of all the species to gradually evolve into a connected whole ecosystem. With the exception of organic farmers, humans are making almost no effort to fit into the ecosphere, and I wonder if the organic farmers realize they are destroying the smaller local ecosystems that had evolved in place, in their desire to make a “better” ecosystem that serves primarily humans and not the whole of life itself. Without asking why better and for whom. (I once asked an economist turned organic farmer; he got very angry with me.) The idea seems to be that we should change the ecosphere — not fit into it so that we can be sustainably healthy. I think organic farming is probably a good thing, but I also believe we are not doing it for the welfare of the whole, but only for ourselves, and – again – we are not God who created the whole, and we may not know what is better – especially if we don’t even bother to ask the question. Bottom line is that we cannot change the basic laws of nature. What we could do is the real meaning of adaptation; that is, change our behaviors so that we can fit helpfully inside the biosphere. We live on earth only so long as we obey the laws of nature; we can change our behaviors, but we cannot change our physiology – we can’t change how our heart beats and what things poison our cells, or how our bodies use the breath of life to stay alive. Neither can we change how the biosphere stays alive by balancing the air, water, fire and earth within its living self. Most people know this. Most people do want to move toward a more compassionate and sustainable relationship within the biosystem. Even so, I have been to meetings of many groups, from organic farmers to community organizers to politicians to religious or spiritual groups, all of whom know these things are true, and they care very much about the biosphere and our humanity within the biosphere, and they are trying to organize a new set of relationships that will bring a better balance between the biosphere and human needs. What I have not recently heard talked about in this sort of meeting, whether it be organic farmers or community organizers or religious/spiritual organizations (and I have been looking hard among groups who claim to be concerned about the health of the biosphere) – what I have not heard is any effort to understand and honor what makes the biosphere sustainable. Nothing about the welfare of the biosphere itself. For its own good health. All we talk about lately is how can we force our will upon the earth ecosystem with our human technologies. The answer to these ideas is that we are wasting a lot of time trying to do impossible things. We cannot force our will upon the ecosphere. We are not God, who created the heavens and the earth and breathed life into them. What we can do is learn to understand what the earth ecosystem needs to be healthy, and change our behaviors to give the earth ecosystem what it needs. What does the ecosystem need to stay healthy? Minimally it needs us to re-balance our populations so that we are not consuming more of earth air fire and water than the ecosystem can provide — nor producing more toxic effluents than the ecosystem can tolerate — so that we are not unbalancing the cycles of air, water, healthy earth and food energy that make up the healthy earth ecosystem. Frankly, I am not interested in any opinions about technologies as a cure, because that route is so chancey and the real solution is so simple. (Simple to understand, not easy to do, but we DO understand it, and it is not impossible; changing what the biosphere requires to be healthy IS impossible. Difficult is easier than impossible, so why are we holding back the solution to the problem?) Simple to understand. Our technologies have unbalanced our nest until we have more people than the earth can feed sustainably. The cure (also simple to understand) is to reduce the overpopulation as quickly and as compassionately as we possibly can to a level that the earth ecosystem can support without changing its climate to the point where humans can no longer live here. So long as we refuse to use the technologies we already have, in combination with education about how the biosphere functions to stay healthy, we will continue to decline in all parts of our societies. So long as we continue to try to change the world to suit ourselves, and we refuse to change our behaviors to suit the world — we can not take the big step to evolve (adapt) our behaviors into more compassionate, sustainable and rewarding societies. Because starving people cannot learn to be compassionate or peaceful. Bare Bones Biology Climate Change Series is BBB-092 through BBB-100.